It was a cold and rainy on Sept 9th and somehow we toured the Theodore Roosevelt National Park and drove 297 miles to Jamestown arriving just after 6:00PM Central Time. I learned a lot of new things about T.R. compared to the two books I have read. He wrote more books than any other President. The ink well was used to write some of them in his cabin. A New Yorker he took the train west to Medora and bought a ranch he liked the place so much. He loved the outdoors and learned how important conservation is to preserve the wilds. After becoming president he was responsible for starting the Forest Service, five National Parks, and 51 wildlife refuges. The horse sculpture is the third we have seen on this trip. This one is made of wood strips. The clothes and saddle belonged to T.R.. This town is all about the National Park. It closes up for the winter which starts September 6th. We went to the Elkhorn CafÃ© for lunch and was greeted by the owner. When she found out we were from Nashville she really warmed up as she had worked there with Cracker Barrel. She was an MP in the Marines and married a Missouri State Trooper. Her husband has family here so when they both retired they came here and started the restaurant. In the summer she has a staff of 9. A waiter can make $600 per day on tips the place is so busy. Mavis asked about Patty Melts and the owner couldn't believe anyone from Nashville had never had a Patty Melt. I had breakfast and it was great. A few miles east of Medora there is fracking going on with new oil wells being created. If you need a job go to western North Dakota. You can test the low level of unemployment at McDonalds. They are so short staffed in Jamestown, 300 miles from Williston, you have to wait and wait to get served. One lady said the pizza shop had stopped delivering. It was the same story in Glendive 100 miles from Williston. It's the gold rush story all over again with lots of problems. At Bismarck I filed up with diesel at the strangest pump yet. I could dispense #1 diesel, #2 diesel and three other blends of #1 diesel with% bio diesel. How anyone decides on the blend I have no idea. #1 diesel is the most expensive and #2 the least expensive. There is not a lot to see once you get to the prairies so the World's Largest What Evers provide some interest. 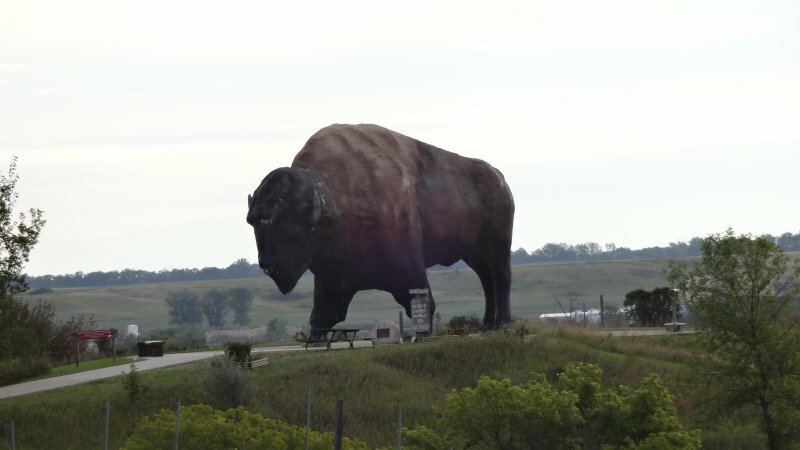 At Jamestown, ND we saw the World's Largest Buffalo outside the National Buffalo Museum and a whole valley of grazing buffalo. The Frontier Fort campground we stayed at is right beside this attraction. Another World's Largest is at Frazee, MN. There are two sculptures here of the World's Largest Turkey. One is painted colors, the other is larger, all black, and is beside a very large turkey farm. On the 11th we stayed on a friend's driveway in Brainerd. That evening we went to the Bar Harbor Supper Club in Nisswa, MN with friends and had some fabulous scallops. Sorry, no photo. Friday, September 12th we drove to Woodbury, MN and are visiting with family. Sunday, September 14 we head for Murray with a stop in Madison to visit our freshman granddaughter at the University of Wisconsin. We hope to get to Murray on the 16th, pick up the car and return to Nashville.